At SurveyRock we know it can take time and experience to create a survey that will provide you with actionable data. With that in mind we now provide survey templates to help save you time in your survey creation process and help you gather better feedback with your survey. You can use our survey templates for the most common types of surveys and as always you have the ability to create you own survey. 1. From your Dashboard, click on “+Create” and then click “Survey from Template” on the menu bar at the top of the screen. 2. 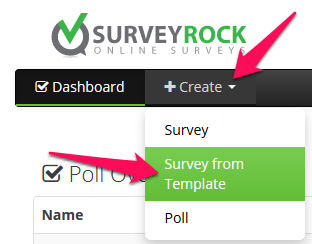 You will see the survey template titles displayed alphabetically. To preview one of the sample questionnaires, just click on the template title and it will open up in a separate browser tab. When you’ve found what you’re looking for, click on the “Select” button to the far right of the template name to copy the survey template to your Dashboard. 3. The new survey is now at the top of the list on your Dashboard with the phrase “From Template -” at the beginning of the title. Click on the title to edit it just as if you had created the survey yourself. From Advertising Feedback Surveys, Customer Surveys, Employee Surveys, Non-Profit Surveys, and Education Surveys our survey templates are available for you to use during your survey creation process.